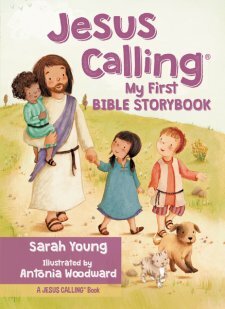 For those who loved Jesus Calling for Little Ones, there is a new children's poop to accompany it: Jesus Calling- My First Bible Storybook By Sarah Young and illustrated by Antonia Woodward. Just like the original book for children, this new bible storybook is a new little board book based on the well know "Jesus Calling" series. Written on the first person, as if God is speaking directly to a young child, each colorful two page spread features a simple reflection and a biblical verse to go along with a well known bible story. Stories include the creation, Noah's ark, the birth of Jesus and Jesus Calms the Sea. Brightly colored art is featured on every page- with literally no dead white space. Woodward's inviting drawings bring the bible stories to life. The art is better quality than what you would expect from a small board book. This is a perfect introduction to the bible for toddlers and preschoolers. The stories are short yet capture the important themes. Illustration go along with the story to put a face to the bible accounts. My two youngest loved the first board book and now they enjoy this second book. As a blogger for Booklook I received a copy of this book published by Tommy Nelson, an imprint of Thomas Nelson publishers for the purpose of writing this review.